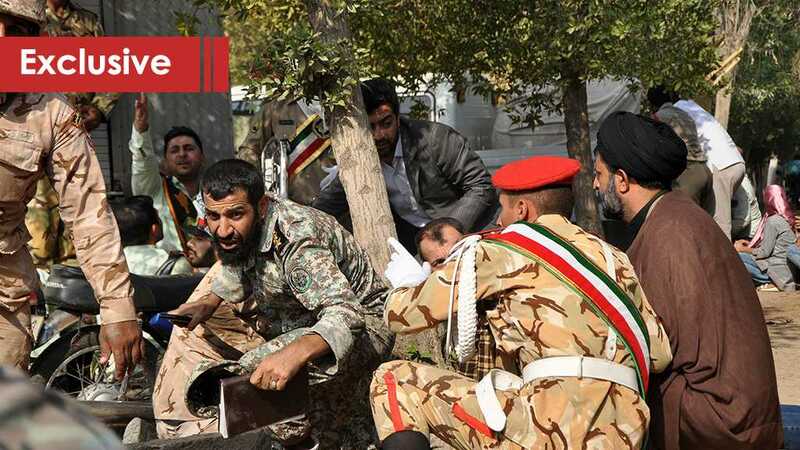 The Iranian Revolutionary Guard announced on October 1, 2018 that it launched a rocket attack targeting terrorist headquarters in the east of the Euphrates in Syria in response to the attack on a military parade in the Iranian city of Ahvaz on September 22. The IRGC declared in a statement on its official website «Saba News» that they “targeted the headquarters of the leaders, who committed the crime of terrorism against Ahvaz city, in the east of the Euphrates” minutes before the ballistic missiles land. The missiles, fired at 02:00 am on Monday [22:30 GMT on Sunday], were launched from Kermanshah province, western Iran. The Iranian strike east of the Euphrates was confirmed Monday by Cmdr. Sean Robertson, a Pentagon spokesman, in an email to Military Times, who called it “reckless” and “escalatory.” “While no Coalition forces were harmed, we are still assessing the strike, and given the complex nature of the battle space, such strikes potentially jeopardize the forces who are actively fighting ISIS in Syria,” Robertson told Military Times while stressing, “firing any missiles through uncoordinated airspace is a threat to civil and military aviation.” Robertson seems to have forgotten the US missiles that passed over Lebanon to strike Damascus and the danger they posed on civilian lives only because they were fired by the US. Furthermore, Monday’s strike was the second missile attack by Iran in a month, and came as tensions rise ahead of renewed US sanctions targeting Tehran’s oil industry that will take effect in early November. A Video released by Iran showed the missiles reaching skyward in the dead of night. The IRGC scripted the bombardment as it had with the September 8 attack on terrorist groups in northern Iraq. During that ballistic retaliatory attack, the IRGC used seven Fateh 110 missiles and fired them near Tabriz. Kermanshah is 200 km south of that launch location. These missiles represent a new achievement for Tehran, with new technical features. The IRGC chose the Zulfiqar and Qiam ballistic missiles to target terrorists in Syria, which had been used last year in June to target ISIS terrorists in Deir Ezzor province. Iranian media published pictures and video clips of the rockets, which passed nearly 570 kilometers to reach their targets in Syria, as well as a short video showing unmanned aerial vehicles targeting the terrorists’ sites. To fire the missiles over Iraqi airspace, Iran should have definitely coordinated with Baghdad. This leaves us to believe that the US Coalition occupation forces operating in Iraq and Syria should also have been notified via Baghdad, but a statement from their spokesman said they received “no notice.” The target of the missiles in the eastern Euphrates area would have been close to US occupation forces and the forces they have been training to fight against the Syrian Arab Army. The US has repeatedly called them the “Syrian Defense Forces” but all intelligence reports from Syria, Russia, Iran, and Iraq have reiterated that these forces are none other than ISIS terrorists who put the Daesh flag down, shaved their beards, and joined the forces loyal to the US to get arms and money. The attack shows Iran’s reach throughout the region and that Iran is willing to strike wherever a threat resides and knows that air defense systems in Iraq and those by the Coalition occupation forces in eastern Syria will not interdict it. As the Iranian missiles hit direct terrorist targets in the eastern part of the Euphrates, members of the quartet to exchange security information against Daesh, which includes Iran, Russia, Iraq and Syria, have confirmed in Baghdad that the committee’s activities will be strengthened and increased in the face of terrorism. During the meeting in Baghdad, which was attended by Iranian, Russian and Syrian ambassadors to Baghdad and Major General Osman al-Ghanmi, the chief of staff of Iraq, member states of the Quartet agreed on “the need to strengthen the activity of this committee to achieve the final victory”. It is clear now that Iran is determined to continue cooperation with the regional axis of resistance states until the elimination of terrorism, which has recently been threatening its own Iranian citizens back home. As the US and its regional Gulf allies increase their warmongering rhetoric against the Islamic Republic of Iran, the IRGC has been trying to downplay the US’s instability in the Middle East by coordinating its efforts with Iraq, Syria, and Lebanon. The US, which is used to receiving little to no pushback for the massacres it directly or indirectly created across the Middle East, can expect to start receiving hard resistance this time. The international community as always finds it difficult to condemn the illegal US presence in Iraq and Syria and its support for blood sucking Wahhabi regimes in the gulf while secretly fighting Al Saud’s war in Yemen causing hundreds of thousands of deaths and irreversible destruction. However, the increasing efforts of allies in the axis of resistance alongside their regional Russian partner has shown effectiveness and steadfastness in eliminating the threat of terrorism supported by the US and funded by their puppet regional gulf states. You see, there is no need for the international community to condemn or denounce the continuous US terrorism in the region under the pretext of spreading “democracy.” The regional anti-colonial and anti-Zionist players have set their minds to apply the real notion of democracy by collectively implementing their right to self-determination and their own path of choice in the face of the American war machine that has taken more than enough lives of our own across the region. The IRGC’s retaliatory attack yesterday is a larger message than that of the ballistic missile strike. It shows that Iran can target the “Israeli” occupation forces in Palestine, the US bases in the region or the warmongering Al Saud when the time comes. It is just practicing by using its missiles on ISIS first. Iran and Hezbollah Are Ready to Face Any Challenge: But Are Israel and The US Ready?